Bank of the Ozarks (OZRK) is officially the first company of 2014 to announce a dividend increase. OZRK is a local regional bank that declared a 4.8% increase in their annual dividend. It is not surprising that the news did little to excite markets. 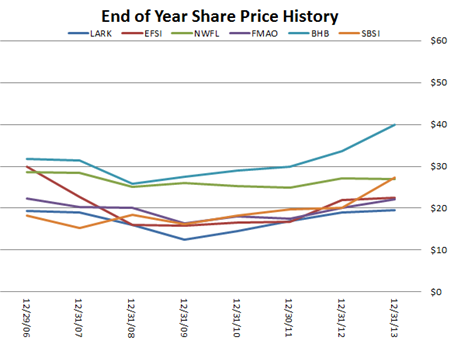 Local or regional banks are thinly traded small cap stocks that barely register on Wall Street’s radar screen. Though listed on major exchanges they have low daily trading volumes and you never hear of anyone becoming a millionaire from gains in stock prices from these little financials. There are positives to investing in small regional banks. Unlike their larger brethren they are not exposed to massive financial scandals or undermining of the economy. They exist as part of our community by providing financial services to you and most of your neighbors. They sponsor little league teams or help with the Women’s Auxiliary Club. They have personal relationships with other businesses in the community helping them grow their businesses. And many have been serving their communities for more than 100 years. So if stock price gains are slow why invest? Surely there are better investments. But, if you are a dividend growth investor these can be little gems of steadiness in your portfolio. Many pay dividends and even grow their dividends year to year. Most likely not the fastest dividend growth rate in your portfolio but when you factor in their low stock price volatility they act similar to utilities and provide some steadiness during market down times. David Fish’s “Dividend Champions List” from http://dripinvesting.org/ provides a list of all stocks that have continually grown their annual dividend payouts for 5 years or more in a row. Of the 482 listings 50 are represented by banks. Of the 50 bank listings 45 are small cap regionals. And to break it down even further 18 of those companies have a dividend yield greater than 3%. The price chart below depicts the tight trading range over the last eight years and even the financial crash in 2009 had little effect on share value. 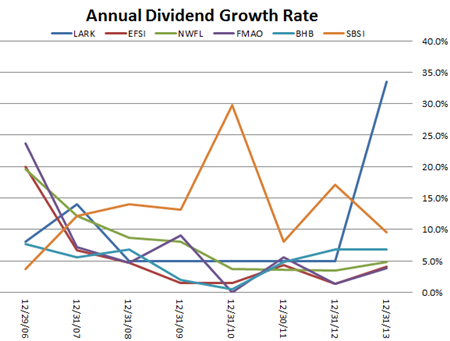 With the exception of LARK and SBSI, the dividend growth rate from year to year falls into a median range of a 5.5% increase year to year. Some years obviously were better than others but long term a 5% to 5.5% average growth rate is not too shabby. As stated earlier, regional banks with their low volatility in stock prices make these very similar to utility stocks but with an average dividend growth rate of 5%-5.5% a year makes it by far a better long term investment. I am of the opinion if you are looking to reduce risk within your portfolio through diversification then consider adding some regional banks and not limit yourself to utility stocks. In the long run your passive income stream will thank you.